The little guy is at an age now where he is not super happy with being fed baby food. Actually, that is an understatement. He will not WILL NOT eat anything unless we give him something to eat on his own. This would indicate that it is time to move on from traditional puree’d baby foods, right? Yes, of course, and we have largely done that – but there are times when he thinks he has eaten everything, but most of it is on the floor – so it is good to sneak a little puree’d baby food in there to make sure he is getting a real meal. I do this by waiting for him to finish a bite of his own, and then give him a spoon of baby food. We alternate and usually he is so focused on his next bite I don’t even think he knows that I am feeding him in-between bites. 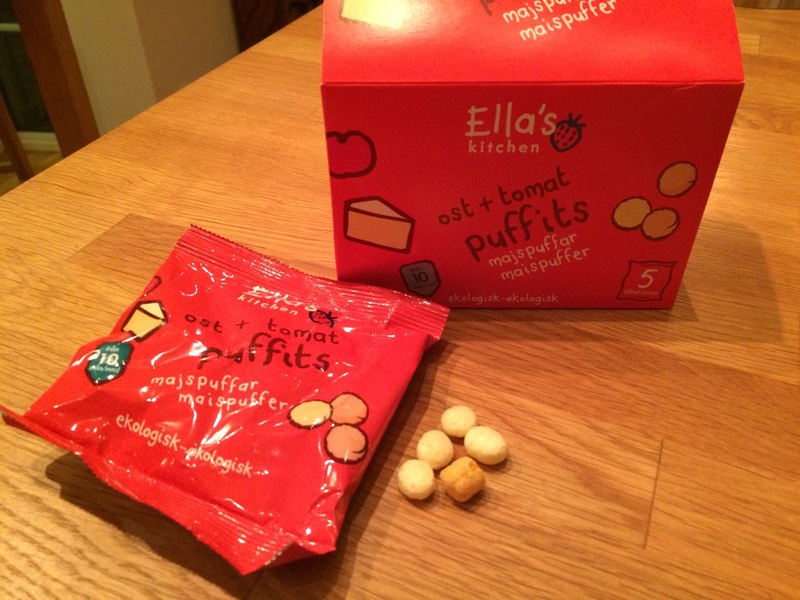 The “puffits” are sold in a box with 5 bags per box for around 30 kr (27 hkd, 3,50 usd). I believe there are 2 flavors available in Sweden, one with fruity flavors (the little guy is boycotting sweet flavors, including all fruits at the moment), and the one you see in the photo, which is cheese and tomato. You can also see the size of the little puffs. They are perfectly sized because the little ones can’t choke on them, but they still understand you have to chew on them before you swallow them. Also, unlike all the other “puff-like” chew things, the flavor on these is in the actual puff, not in a powder that makes the hands all messy. Nicely done, Ella’s Kitchen. That s a funny period. We use bread, he likes it very much.